Quick! Write 15 bullet points of things that appeal to you on blogs. Has info I'm looking for (e-mail, twitter button, search field). Dark colors (purples, reds, blues). A cool design. I love headers! Themes. I looove when a blog has a theme and it is carried throughout the blog. The ratings, the lingo, the graphics. A clever or interesting blog name. Fun stuff! Cool memes, pretty graphics, clever features. When the blogger interacts with you. Either they will comment on a comment you left, visit your blog or talk to you on Twitter. Easy to comment. No captchca. Easy to load. I know this isn't always the blogger's fault, but there are some blogs that freeze my computer. When some of their personal life shows through. It can be as simple as mentioning their dog's name to being extremely and open with many aspects of their life. Approachability. I love when a blogger really encourages and welcomes EVERYONE to comment, participate and discuss books. What about you? Do you agree or disagree with any of the above? Tell me if I missed anything! 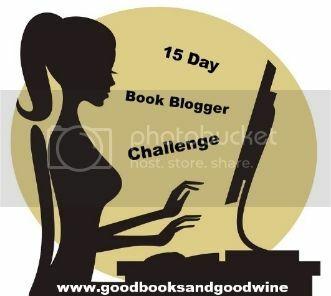 Labels: 15 Day Book Blogger Challenge, Appealing Blogs. A non-cluttered, themed blog is my favorite as well. I find it hard to focus on the posts when things are flashing and moving on the sidebars. This might also be a reason why I have a love/hate relationship with GIFs. Really interesting things to think about - I'm scanning my blog now using these tips :-) My favorite thing on a blog is "personality" - let it shine through! I totally fail on the dark theme: It is ok though, it is my job to bring bright shiny colors into your world. My mission, and I chose to accept it! @Lizzy-I'm not a fan of gifs either. @Tanya Patrice-It's really fun when a blogger opens up to their audience. It helps give the blog a real niche. @Felicia-It's okay...you have all the other awesomeness and more on your blog. It's like blog professionalism to the max!